We argue that while practice has changed, the ideology of qualitative research has not. Qualitative research is generally understood as the individual exercise of research methods to produce knowledge about the world, knowledge that can then be taken up by governance actors of all stripes. By contrast, we believe that today we must understand research as a systemic intervention, within the broader context of globalization and international development. Therefore, we should start with the political economy of contemporary research—an iterative, professionalized and increasingly saturated practice—to rethink the political and ethical implications of the research that we do. There’s a lot at stake here. Saturation shapes how people respond to researchers. Over repeated experiences as research subjects, “respondents” might instrumentalize research projects and researchers for private ends or political ambition; regurgitate “correct” answers; become antagonistic or cynical towards researchers; and so on. Professionalization shapes standards and benchmarks, the written and unwritten norms, by which researchers conduct and consume research. Together, saturation and professionalization mean that research has a cumulative—and increasingly systematic—impact with significant implications for method, ethics and politics. This is hard to show through the fragility research framework, which concentrates on individual acts of research, and fragments the questions we might ask about three areas of concern: first, how research subjects experience the act of being researched; second, how and to whom researchers view their roles and responsibilities; and third, how research—once produced—is used in the endeavor of global governance. However, the abundance of anecdotal support for issues associated with professionalization and saturation suggests the need for a new framing that places individual acts of research within a broader system or practice (see, for example, Chambers’ work, which pointed to this over two decades ago). We seek to provide initial steps to that end, drawing attention to the fragility research framework’s tripartite division, and offering an alternative framing that emphasizes the interconnections among politics, technique, and ethics. 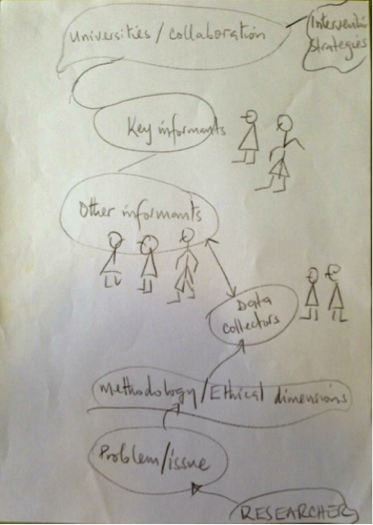 We asked our participants to “draw their research environment.” Top: a Ugandan researcher drew an image of the research process as a chain (with no prompting from us). 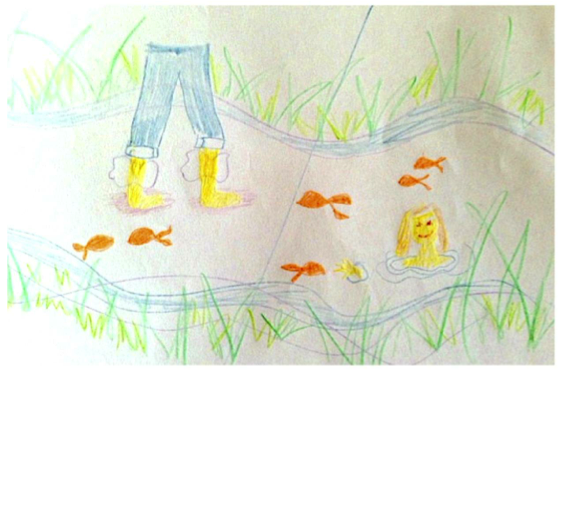 Bottom: an international researcher illustrated the contradictions between submerging herself in the context while at the same time standing over and moving through it.